i said to myself, i need a big chunky circular scarf to wear all the time.. and this is what came of it. to finish the dc4together, yarn over once, and draw through all 5 loops at once. to finish the dc7together, yarn over once, and draw through all 8 loops at once. row 1: turn. ch 1, 2 sc, *skip 3 chs, 7 dcs in next stitch, skip 3 chs, 3 scs* ; repeat from * to * ending with 2 scs. row 2: turn. ch 2. dc4together over (sc, sc, dc, dc), *ch 3, 3 scs, ch 3, dc7tog over (dc, dc, sc, sc, sc, dc, dc)*; repeat from * to * across, ending with dc4tog over (dc, dc, sc, sc), skip turning ch. row 3: turn. ch 2. 4 dcs in dc4tog, *skip ch-3, 3 scs, skip ch-3, 7 dcs in dc7tog*; repeat from * to * across, ending with 4 dcs in dc4tog, skip turning ch. row 4: turn. ch 1. 2 scs, *ch 3, dc7tog (over dc, dc, sc, sc, sc, dc, dc), ch 3, 3 scs*; repeat from * to * across, ending with 2 scs, skip turning ch. repeat rows 1-4, 2 more times. do not bind off. connect the two ends of the scarf to create a circle and slip stitch them together. bind off and weave in ends. I did not know you had an etsy shop! :D very lovely stuff! this is amazing. i think i need to make it. and yes, maybe we'll see you soon on the west coast! hmmm....mine? I think I too need to make this! And it was nice seeing you guys the other night. If you ever get bored and need some company or a thrift store adventure, you know where I live. I just said on my blog that I needed to crochet a large cowl scarf for myself since I never wear a coat in the winter, just lots of layers. So happy I found this. I want to try, but I can't really figure out the pattern. I have rows 1 and 2 complete, but row 3 isn't looking right. Is there a trick to it? Or maybe I just need to have faith in the pattern and roll with it? for row 3, after the ch2, the 4dcs go right into the last stitch from the previous row. (it's the stitch that looks like a little circle and is the center of the wheel) so that group is half a wheel, and after that you sc in each of the 3 next scs. and then just make 7 dcs in the center of the next wheel. row 3 should mirror row one, where they are always the top half of the wheels. and rows 2 and 4 and their 4dcs together are the bottom halves of the wheels. i hope this helps! otherwise,maybe a video tutorial of the catherine's wheel stitch would be easier! I found your scarf on Pinterest and I am in love. I have to pick up another skein of Simply Soft and I am ready to go! I also shared your scarf on my blog. Thanks for the pattern! hello jessica! i hope this helps, it's super long, but is really easy! and mostly repetition. oh! and the dc4together and dc7together aren't all in one stitch, they each take up 4 and 7 stitches. now to finish the dc4together, yarn over once, and draw through all five loops at once. this is the same as dc4together except through seven stitches instead of four. so yarn over once, insert hook into the next stitch, draw up one loop (3 loops on hook)....and so on until on the seventh stitch, yarn over once, insert hook into the next stitch, draw up one loop (9 loops on hook), yarn over, draw through two loops, (8 loops remaining). i hope this is understandable! let me know if you have any more questions or if i can clarify something better! I am a bit confused with row 2 as well. When I do the dc7tog mine is over (dc, dc, dc, dc, sc, sc, sc) instead of your (dc, dc, sc, sc, sc, dc, dc). Was I supposed to skip stiches when doing the ch3 right before? Or does the dc7tog go in the next stitch after the 3rd sc? Thank you so much for this pattern!! I just made one and absolutely love it! I also posted a link to your beautiful scarf from my blog. Hi Lindsi, i started the scarf but i'm not sure what to do at the end of row 2 when you say "sk tch" Thanks! I have figured out rows two three and 4 but can't get past one. With the amount of chains and the total stitches, it doesn't equal 132. 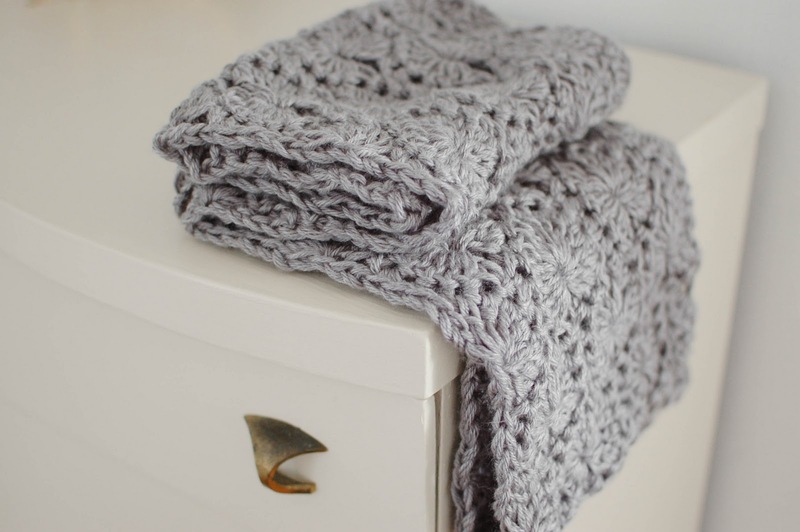 I love this scarf and would love help with this! Thank you! tch is Turning Chain. So It just means you skip that and dont't do any stitches into that chain. I hope this is what you meant here. i'm sorry i missed your comment Ladymend! it means just like Shannon said,(thanks Shannon!) , to skip the turning chain and don't do any stitches into it. the turning chains are the chains in the beginnings of each row. (on this row it's the chain 1 from the beginning of row 1.) the turning chains on this pattern don't count as stitches. hi Ashley! i hope this helps, sometimes it's hard to know where to put the first stitch for it to work out. then continue on with the pattern,ending with an sc in ch 2, and sc in ch 1, and it should work out.. then if you ever want to change the length, it's just any multiple of ten stitches plus one. then one more chain for the beginning of row one for it to work out. thanks!and i hope it works! I love this pattern, except I am finding large holes, especially when in the chain 3 areas. Am I missing something? So I think I might have figured out this problem...I think. I was having the same trouble with a big gaping hole at every wheel. Then I watched a video and on it he suggested when doing the dc7tog do one chain to connect all of them, and THEN chain 3 to continue on. So in essence, doing the dc7tog then chaining 4. I've only tried these variation on a few wheels, but it seems to be making the difference for me! Hope this helps someone else too! Thanks for sharing this pattern. i also am having the problem that jayer34 is having with the large holes and for some reason the length of mine is WAY shorter than the 60" you said it should be. I know I am a tight crocheter but i can't believe it's like 20" shorter. i am not sure where I went wrong. and lindsey, i think it's probably just that i crochet really loosely, i'm sorry! you can use a bigger hook, or else just add multiples of ten to the original chain until it's how long you like it. the pattern works out for any multiple of ten + one. (and then plus one more chain for the start of the first row) i'll put a note on the post about this! thank you! When you say " the pattern works out for any multiple of ten + one. (and then plus one more chain for the start of the first row)" does that mean instead of 131 it would be 142 for the total number of chains and then start with the ch one, 2 sc on the next row? and then if i want to add more it would be 153, 164 and so on? and hi kim! it's just a multiple of ten + one for the beginning chain: 131, 141, 151 and so on. and then start on row one with the chain 1, 2 sc and onward. i added the (and then plus one more chain for the start of the first row) so someone wouldn't forget to still do the chain 1 that's stated in the beginning of row one. sorry for the confusion! So I'm getting hung up on row three as well. Are you supposed to do all of 4dcstogether in the first stitch (little circle in the center) ? Also after doing the 4dcstog and 7dcstog are you not supposed to chain 3? Love the scarf and really want to figure out the pattern, but I'm getting stuck on row 3! I am also slightly confused by row 3 still. Since you skip the ch3 before the 3 single chains, are the ch3's supposed to be able to stick out slightly? Mine do unless I make them lay flat. I hope I am not doing something wrong! hey, i sent you a message on to your etsy account, but realized i could just leave a comment here. i started off with my chain being 60" long like you said, but now that i'm 2/3's of the way done, i've somehow lost 10 inches. should i just start over and add multiples of ten or can i keep going and somehow add to the ends before i join it together? 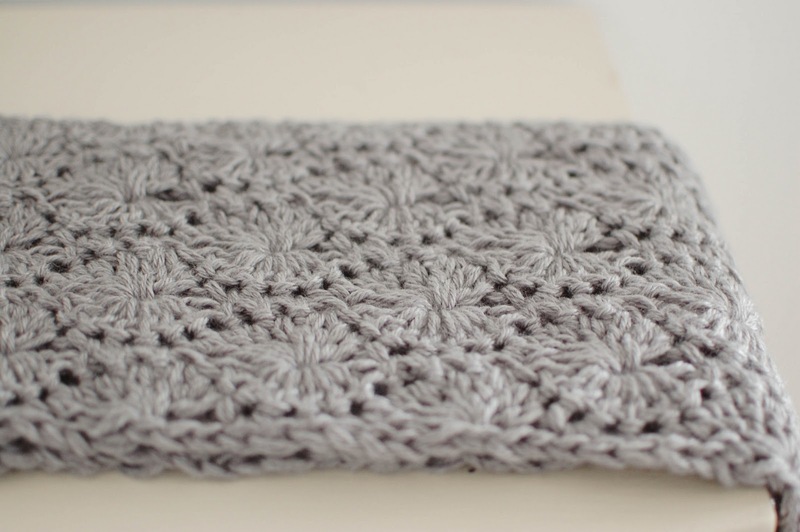 I've been searching for a circle scarf/cowl pattern that was this cute for so long! I've done 4 rows so far and I love it! Thanks for the pattern! So i just started making your scarf and i love it! i got through row 1 perfectly. but then row 2 started out okay and then it started to bubble and it wasn't laying flat like yours does. i ripped it out a couple times but each time i re-did row 2 it bubbled.. i'm not sure what i'm doing wrong because i'm doing my rows super loose. I just found your blog and love this scarf!! But I am more of a visual person :) Let me know if you ever do a video tutorial!! I love this pattern and have just started making it. I have no problems with the pattern but I've only got half way and run out of yarn (simply soft, two skeins, length of cowl now 56 inches). I will have to get more yarn anyway but could you just make a note of how long your skeins were please? question row 3? do you mean skip chaining 3 stitches like how in row 1 you chain 3, and then single crochet 3 scs? or do you skip 1-2-3 stitches and then 7 dcs in the 7 altogether? let me know if i need to clarify any of this! i know it's confusing through written instructions! ch 2, 4dctogether (this stitch starts with the very last sc from row 1, and uses up 4 stitches from row one all together) ,ch 3, don't skip any stitches from row 1,and sc into the very next stitch, sc into the next stitch, sc into the next stitch, ch 3, don't skip any stitches from row one, and go right into the 7dctogether(which uses up seven stitches from row one) ch 3, sc into the very next stitch, sc into the next, sc into the next,..and so on. at this point you should have crocheted into 17 stitches of row one. i used a little less than the two skeins of simply soft, my skeins were 315 yards. i'm sorry that you ran out! i've run out a few times if i crochet a little more loosely than i normally do. i'll put up a gauge measurement on the pattern,so more people don't have problems with the sizing. thank you for writing! thanks for writing back :) I really love this scarf and your blog! i have another question. it is really hard to relay this info through written instruction haha. but okay about row 3 just to clarify am i skipping row 2's three single stitches? or skipping chaining 3? sorry this is getting a bit ridiculous for you i'm sure! I just felt in love with it! Lindsi, thanks so much for this pattern! I really want to be able to make it! In row one when you said to end with two single crochets which i think should be in ch 2 and ch 1. Does that mean that the last time you repeated stitches instead of a set of 10, you did a set of 9 stitches? I am wondering this because at first I thought you finished repeating the whole block of ten and then had 2 more sc but that amount of stitches doesn't work out. Thanks again! Lucky you! I tried and was stitching way too tightly. I have never croched before! Do you think this pattern would be too difficult to begin with? I love the scarf and would really like to give it a try. okay, i'm a new crocheter-i don't understand why in row one you turn, then chain one right after you chain 131. wouldn't that be chaining 132? i really really love this and want to try it! thanks! I love this pattern! I had to make it as soon as I saw it on pinterest. :) I used a P (10mm) hook and Bernat Roving Bulky yarn. It took me about 2 1/2 skeins. I think I know what some of the confusion on the pattern is since I'm still fairly new to the Catherine Wheel. (I would suggest if you're new to it checking out a video on youtube to see how it's supposed to lay out!). The repeats of row 1 & 3 where you're making the "top" are the hardest. You're crocheting into the tiny loop that is made on the previous row when you do the first chain after combining the 7 stitches. When you get done doing 7 double stitches into that "wheel", it looks like you're skipping a couple of stitches. You pass over a loop (for lack of proper words!) and then the three chained stitches from the previous row. When you repeat the first row (and on the third) you are skipping the three chained stitches. I don't know if this helps anyone at all, I just know that was what really confused me the first time I tried making this stitch. I ended up with lop sided wheels and a lot of frustration. :) Thanks again for a fabulous pattern!! I found this pattern on Pinterest a few days ago and had to make it! I'm 2/3 the way through as well, and have lost some length. Should I just be starting over and adding a chain of ten or can I add on at the end? Thanks for sharing this! I love it. I've already made two. And I'm thinking of making a blanket from this stitch. Will you be posting any more of these scarves on your etsy shop anytime soon? I would love to purchase one! I love this scarf! I also found this pattern on pinterest but I am not having any luck. I've tried 4 times now and mine is just not working out. I'm not new to crochet but I can't see where the problem is! Thank you for posting the pattern, it's beautiful! I've made 4 in two weeks! It was a little hard at first, but I saw a video on YouTube for the Catherine's Wheel and it made sense. I made my last one without looking at the pattern! lol very lovely. I made mine in a Caron simply soft aqua color I absolutely love it!! Thanks so much for posting this scarf pattern even while you're selling them. =0) I appreciate it bunches! This is the first time I'm trying a Catherine's Wheel, and you've laid out the instructions so well. Though I seem to have bungled it a bit..... hehe. Peace and love from Africa! Thanks so much for sharing this pattern! I just made it as a Christmas gift for a good friend. She is going to LOVE it. Lindsi, I am also very confused by row 2, I can't figure if you are supposed to the stuff inside the(???? )I know my question is kind of ridiculous but I just can't figure it out!!! I have been stuck on the first all day. The math doesn't seem to add up! For every repeated section, that is 10 stitches. With the 2 sc at the beginning and end, it almost seems like you would need 134 stitches, not 131. Everytime I get tothe end with 2 stitches left, I still (on the pattern) would have needed to sc 3 and THEN sc2. I'm confused as to how you managed to make yours work out! i have the EXACT same problem, and I don't know how to get past the fact that I have just 2 stitches left for what seemingly needs to become 3scs and 2scs! Please help? Like everyone else I love your pattern. I was wondering in row 2 after I do my last dc4 tog over will I have 4 chains left on row 2 before I turn and start row 3? I wasn't quite sure how I was supposed to end correctly. Please help. Thanks! I also wanted to create a smaller cowl, so I began with 111 chains and a smaller hook. Maybe that's my issue! Love this pattern! I used the same yarn and had no issue with tension, it's a perfect size. I made it with just 8 rows for a little less bulk (giving this to an older person). Next up one for myself with all 12 rows. Hi! I was wondering if you could make a youtube video for this. I'm just starting to venture into more advanced crocheting and am unsure about some of the stitches. thanks so much! When you say over sc, sc, dc, dc, for the dc4tog at the beginning of row 2, how does that work? the last five stitches of row 2 are all sc so those four in the dc4tog would all be over sc, correct? Row "5" isnt the same as the very first row, since there is a lot more than chains going on haha!! 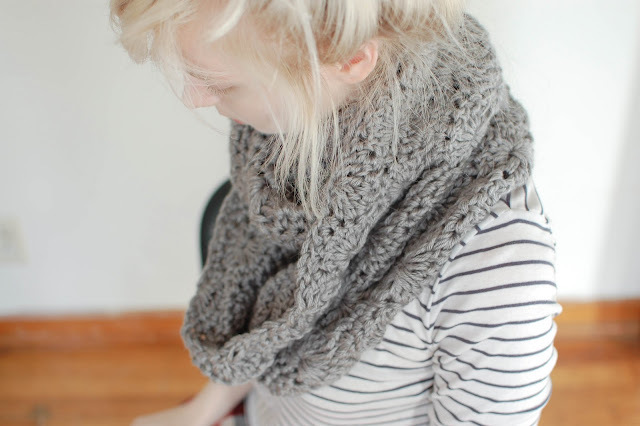 Grrr, I love this cowl/scarf sooo much, it's beautiful! I just want to finish it:) Slight crochet meltdown here!! Help!?? Last 2sc in row 4....My daughters just yelled "Hallelujiah!!!" I guess I was visibly frustrated:) whew.... Now my enthusiasm to finish is BACK, This is going to be so soft and beautiful!! Thank you SO MUCH for going back and explaining that. I had the same problem. Hahaha thank you thank you! I'm halfway through making one with super chunky yarn and I love it already! Great pattern...easy to follow. Thank you! I have a feeling I will wear this daily. Beautiful pattern. Making my second one now. Thanks for sharing! Thanks for sharing this pattern--in love! i love this pattern! it was a jump in level for me but i was determined to try it and get it right....and i'm in love. watching videos on youtube of the catherine's wheel as someone suggested really helped. thank you so much for sharing!! Please help! I absolutely love this pattern and I am determined to figure it out! In row two after you have completed your last dc7together do you chain three, do 3 single crochet, chain 3 and then do the dv4together? When I do that, I end up with 4 chains left! Does anyone have any ideas of what I am doing wrong? Ok...I am giving up and sending you this note. I love, love, love this pattern and really want to figure it out. My issue: on row 2, after I do the 3 ch (after the dc7together) when I go to make the 3 sc, if I pull it tight, it bubbles so bad it looks like bra...if I don't pull it tight, I have a "loose"yarn laying across. I'm so confused and I doubt this makes sense. I really don't want to throw in the towel! Someone help me please! My advice is to KEEP GOING even if you thinknof looks whacky! I did a few rows and realized why was wrong much later and undid about grew rows to get back to where you are! At least you are doing the ch3, I was forgetting to add it! The ch3 is just making it look like another dc in the pinwheel circle thing o he pattern! Hello! First off, thank you so much for posting this pattern- it's lovely! Second, when you say "2 skeins of worsted weight yarn (i used caron simply soft) using both strands at once throughout, otherwise you could use bulky weight yarn" do you mean you use a strand of a yarn from two different skeins of yarn as if they were one single strand? Might be a silly question, but I'm new to the crochet world! Yes. That's exactly what it means. And, it's not silly. No worries--we were all beginners once. This was a beautiful pattern. I made one for my friend's birthday and she loves it. It was a pretty fast one too, and your directions were impeccable. I linked back to this pattern on my blog. :0) Thanks. If you want me to remove the pictures, please let me know. Keep up the good work and thanks for sharing with all of us. Thank you for such a beautiful pattern AND your amazing patience with all the questions! i just made it and love it!! thanks for the pattern! The last dc7tog sounds like it is immediately followed by dc4tog. This is turning out really weird and I have 4 stitches left after, and it seems like it's going to fall apart unless I do another single crochet or something. Can someone please explain how you finished row 2? Hmm! I like a challenge - feeling all inspired. Your photographs are beautiful. Awesome cowl, I just finished whipping mine up. I added my own little touch and edged the cowl with single crochets. I liked the way it cleaned up the edges, just seemed to pull it all together. Thanks so much for the beautiful pattern. I had a lot of fun making it! my name is Ana and in my blog I publish Spanish patterns translations of English crochet patterns. I love this pattern and I would like to translate it for my Spanish followers. If you are agree with the translation, I'll publish the Spanish version in my web and link yours. I'll send you the pdf file for your free use!. Thank you so much. I did it and I love it!!! I still don't understand Row 2... What is 'yarn over' and how do I get 3 loops on the hook? I learned a lot of my crochet skills on YouTube! There's several videos for crochet. WOW Lindsi, you are so patient with answering all the questions! I really appreciate you taking the time to do that because it has been so helpful with me figuring out this pattern since this is my first time doing more than just a straight sc for an entire scarf (and I was not familiar with all of the terminology). I'm thoroughly enjoying this pattern, and because you have explained everything so well, it's turning out nicely! Thank you! Thank you so much for this pattern. I have made a few different versions of it and love them all. I have linked your pattern to my blog and had some great responses to it. I've just finished making another one of your scarves. I love this pattern. Would there be a way to use these circles in a beanie pattern? Want to make a baby pattern and trying to figure out what the math would be to convert this pattern to that. So I've finished Row 1 and I'm stuck. At the end, there should be 5scs (3scs + 2scs), correct? And if so, the patter isn't matching up I don't think. I'm so lost! Actually, you don't have 5. When she says "ending with 2 sc", she means that instead of 3 sc you will do 2 to replace it. Hope this helps! I am still not quite sure what this means!! 114+3+7 = 124 +skip3+3 = 130... not 131! and it shouldn't be 132, because the ch1 after ch131 is skipped when starting, right? I love this pattern. I used it to make a scarf for my mom. I also posted about it on my blog. Thanks for sharing your awesome pattern. I enjoyed working with it. Lindsi: I love this scarf also...Great pattern made so many for Christmas last year. I only changed one thing...The first row is sc it keeps it neat and gives a nice edge.. Thanks for a great pattern. Let me start this by saying that this is a beautiful pattern. I absolutely love it! I have had no trouble getting the first four rows done. However, when repeating the first row after the fourth row do the 7DC go in the center of the pinwheel or the loop after it?! I have just made one very happy niece! This is really a lovely scarf. Thank you for the pattern. Hello! I made rows 1-4 the first time, but I am having problems transitioning to the second round of row 1 (row 5). It just doesn't look right, and I end up having half of one of the "pinwheels" on the top of another. I believe they are supposed to alternate? Help Please! The finished scarf in your photo is so lovely that I got to work right away. My problem is with row 3. The instructions say to SKIP CH-3 and I'm taking that to mean to jump to the other side of the chain three to work but this is making my scarf all puckered so I know I must be doing the wrong thing here. Can someone please advise as to how this part of the pattern should be worked? I learnt to crochet yesterday evening so that I could make this scarf. I've just finished and love it to pieces. Many, many thanks. i really wanted to do this cowl... but for the life of me i couldn't get past row 2... as soon as i started row 3 it started to look all crooked and not at all like the picture..
then i read a comment where you explain row 3 again.... but it only made things worse for me. I'm an avid knitter... but this pattern is amazingly fun to do! I got through all the instructions easily enough, it's very well described - and you went the extra mile here in the comments too! I started the pattern a day and a half ago - and have already breezed through one and a half of these. I am wondering - is there a way to bind these two ends together without getting a rigid line? Perhaps I'm pulling the yarn too tightly when I do my slip stitch?? Also - do you connect it at every row? Or at every end stitch? Just curious. Thank you so much for this pattern!! I hope to find more that are just as easy to follow and beautiful to wear! Have the same question. I slip stitched my ends together and while you do not see a rigid line, it 'bunches up' together at the point in which the ends meet and I am constantly stretching it back out. I made this as a cowl and the first time did a slip stitch to connect the ends. I didn't like the ridge so I did a row of SC along each end(with a couple of HDC where it dipped down), butted the ends together and did a whip stitch. I can't tell where it is joined unless I really look. The purpose of this coco chanel online write-up is to give you an concept that it is costless to invest in these kinds of large priced hermes handbags online however you also get these higher good quality bags in similar significant top quality but louis vuitton wallets the major factor which tends to make a big difference is the selling price so discount designer cheap omega watches are the very best choice for you if you also wishes to took quality cheap christmas gifts with you. what's the name of these stich pls? When you make your 131 chains and then it says to TURN, does that mean I am now working into the backs of the chains? Thanks for the pattern, I am half way there but ran out of yarn so need to get some more today. Could you send a close up picture of the pattern? I think I'm doing allright, but the 7dctog do not really look like circles. I did go wrong somewhere, but I thought I had fixed it. now I am not so sure. A close up would really help! What a beautiful pattern! But I am stuck on row 4! I can't seem to get it right! The first time I tried it started to ruffle. So I tried again and it just doesn't look right this time. Do you think you could help me?! I'm trying to finish this for my mom before Christmas! Thanks! I just used this pattern yesterday. It only took me a day to get one completed. It's not 10 inches wide though because I used "Loops and Threads Charisma" yarn which is a bulky weight yarn. One skein of yarn will complete 4 rows. I only had 2 skeins so my scarf is only 8 rows wide. It's beautiful. I'm going to make another with the Charisma yarn and then try with a worsted weight yarn. Thanks! Hi, can you send me the draw of the patter? I only know how to read this if I follow the paper so I dont do anything wrong!!! I've made three of these by the way, people love them! Thank you so much for the pattern. Do you think I could follow the same pattern with the same size hook, but only use one skein of worsted weight yarn? So that the scarf wouldn't be as chunk? Could you post a picture of the scarf straight on so it's easier to see the pattern? Row two is really confusing and difficult to see. it might help to be able to see exactly what you did. It's an absolutely beautiful scarf I'm just having a hard time and it would be extremely helpful. maybe you could also do a step by step with pictures like you did the bow headband? it seems a lot of people are having issues with this row. Thank you!! I love the pattern also and had no trouble on the rows so far, my problem is that the ends are not coming out in a straight line, the zig zag. Is this the way they are supposed to be or am I actually having trouble and don't know it yet. All stitches seem to be working out correctly, maybe I am just messing up on the ends. Great pattern!I'm a little confused though. How many sc do i make to make the first row? Fantastic! I WAS WONDERING THE SAME THING AND THE WOMAN THAT WROTE OUT TGE PTTERN DOENT ANSWER PEOPLE'S QUESTIONS..
Can this be crocheted and sold at a craft sale? Would this okay if the tag credits your blog? This is such a beautiful pattern. I'm okay either way...just wanted to check. Just found this pattern and think it's the loveliest thing ever! But could you please clarify what you mean by doing 7 double crochets in one stitch? That part doesn't make sense to me! Thanks so much for this pattern! I featured it on my blog at http://iknitsoidontkillpeople.tumblr.com/post/46810729222/chunky-circle-scarf. Please let me know if I need to take down the picture or the post. Also, do you prefer if this pattern is only used for personal use, or is it okay to use commercially? Hi there..cant you put up a video tutorial of the pattern and the way you make it..i love the look of it and im a beginner at crochet so would love to physically see how its made..
A bit hard, but the result is great! Hi, Just wanted to know just like Brigitte Arends asked in a prior post, if you can post a video of this pattern. I'm not too good with reading the pattern but I can definitely get this pattern if I saw it visually. Please post one, it would be awesome! Hi! I was wondering how you felt about this scarf being used for charity? I wanted to use it to raise funds for an adoption Etsy shop. Hi so I'm loving this pattern and want to make sure I get the first row done properly. Does the row essentially end with 5 scs? So after trying to complete row 1 and having to start over 3 times I finally figured out what I was doing wrong and thought you might be doing the same. When doing the 3 sc, I was doing them all in the same stitch, not over 3 stitches. The first row should end with 2 sc (like in the beginning of the pattern). I hope this helps you! I don't know if you're still actively replying to questions on this page, but I just had a question about this lovely pattern. So, I've completed this once before, and even though it had lots of mistakes it still turned out wearable. However, I've found that every time I attempt this pattern, it starts to get wavy after the second row. It looks kinda funky, too, and doesn't really lay flat. I mean, for the first scarf it was alright since I liked the way it turned out, but I wanted to complete the actual pattern this time. Would you happen to have any advice? Thanks! Love this pattern! I have made it three times lol, the second and third for friends who were envious! Anon above- if it helps, after the second row its suppose to be wavy because you have created the circles, but the following rows should correct that and return the overall pattern to a straight piece again. If that is not happening, there def is something wrong in how you are crocheting it. I just completed this.....great, easy pattern. Instructions were very clear. It only took me a few hours to complete it. My teenage daughter is going to love this :) THANKS!! How do you join the scarf when you're done with it? The ends of my scarf are not straight, but look more like a zig zag..
Wonder how it would turn out with just 1 strand of a thicker worsted weight yarn (red heart). I am going to attempt it and hope it turns out! And hope that I don't have to go buy another skein to finish it! I was hoping to find a 1 skein infinity scarf, but this is the only one that caught my eye! Which means of course I have to see if it will work! Thank you for offering it for free! I love this pattern! Thank you so much so sharing it! The directions were very clear and easy to customize based on personal preference. Can't wait to make another one (I *know* someone will ask for one!). I started mine yesterday and finished it today- thanks for sharing your pattern and for the clear instructions! I actually ran out of yarn with about a third of a row still to go, so I had to pick up a third skein to finish it. I love this pattern! thank you so much! I decided to make a scarf instead of the cowl and stopped on an odd numbered row so it had a nice wave edge. Circle scarf is also called infinity scarf and this chunky circle scarf is really good. It looks so good and it really keeps you warm in times of cold season. I recently got into crocheting and love this pattern! I tried starting the first row and I think I am following it correctly except when I do the 7dc into the one ch, the ch stitch gets pulled and leads a giant unattractice hole :( doesn't seem like anyone has that issue from the comments I've read. Any clue on what I am doing wrong? I try to not pull it as much but it makes it difficult to crochet into the ch. This is usually a result of your foundation chain being stitched far too tightly. You have to relax your hands while you crochet or it will be very difficult. The key of this pattern is large holes, however, in the 7dc in one. It makes it look like sunbursts. Mine does too but it's because I'm using a really thick yarn. I think it depends on the yarn you use and the hook size too. Please, can you send me the diagram. I can do with the explanation. Would also super appreciate a diagram if you could. Thanks. What a great pattern! I used S hook and 1 skein - 7 oz 42 yards - of Bernat Mega Bulky. I only chained about 30 so it is a once around the neck cowl. I only did rows 1-4 and had to adapt it a bit due to that. My thoughts on the chain 3 is that they might be better as sc if someone does not want the holes. Thanks for the time and effort you have out into this pattern and the comments! This is beautiful! Thank you so much for sharing the pattern. I can't wait to try it! Love this pattern. made one for myself, a friend, and now am revisiting to make as a gift for another friend. good stuff, keep it up! I just wanted to thank you for posting this pattern - my cowl came out beautifully! I can't get mine to be flat like yours. I'm on row 3 and i've undone and redone these 3 rows several times with varying tension and I can't figure out what I'm doing that makes mine not flat like yours. It curves. And the rows and straight on top of one each other, if that makes sense...Sad because I adore your finished product. Idk why I can't figure it out. Lindsi, your patience is limitless. Not only have I chuckled when the repetition of questions got to me - after you have explained them all so thoroughly, but I am now inspired to try this lovely cowl pattern myself to see how difficult it really is. Believe me when I say, "I promise to ask no questions if I get confused." I will come back here and read your answers. I love your pattern. Thank you. This looks really pretty. I am thinking about making a baby blanket. Would I just follow the same instructions and make it broader than the scarf? Hi, this is a very pretty pattern, i just want to know what the colour of the yarn you used is called? I just crochet this for my mum over a few days - using pink chunky wool, and it turned out really beautiful! thank you for sharing your pattern and helping us create beautiful things! The pattern works for me, but as I'm a newbie (this is my 2nd item i ever crochet)! - I had to write it down to visualise, watched lots of youtube videos on catherine wheel, and for the first row, I had to tag the chains where I was supposed to dc cos' somehow when i reach the end, I never end right cos' I either miss or did some parts wrongly! after the first 2 rows, the rest was a breeze! Thank you for this pattern - its gorgeous! I know I'm late to the party, but I have a question about the chains in rows 2 and 4. I wondered why the chains on the left of my circles were longer than on the right side once I'd finished 4 rows. I think when doing 7 dcs in dc7tog in row 3, I am putting those into the eye, and essentially the 1st chain of the second 3ch section, turning it into ch2 (I hope this makes sense). I've been able to make it even by doing ch2, dc7tog, ch3. Could you let me know if I'm doing something wrong, please? Many thanks for your time on this brilliant post!